Keep it up DREAMER! Keto is the only thing that has ever worked for me, and I'm not even done losing. 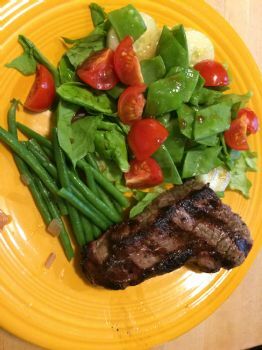 I sat through dinner with a special cake I had made, but I had so much ribeye and green beans and salad that I wasn't even tempted. Karen, that is great advice. I'm with you all the way on this. After many, many years of yo-yo dieting and the saddest excuses you have ever heard, I am well on the road to recovery. Oh Holly, that sounds delish. Rest assured it's on the menu for a few of us this week. My son's birthday is Wednesday. I am baking him a cake, but needed something for the sweet tooth of 2 of us living keto. Naked dogs & burgers, a variety of toppings and ending the meal with this "ice cream" ... could it get any better!!! KD i dont see why you couldnt? i stay away from them the carbs are too high for me and i love peanut butter too much one of my triggers so i just dont have any. but tossing in a tablespoon should work great! Oh my gosh Holly that sounds awesome! I'm cutting and pasting and putting that in my recipe folder!! By the way - can you make that with almond or peanut butter? Beach Dreamer take every day one day at a time. It's so much easier to do that! Don't look down the road a year from now... just know your body is healing itself, and will release the weight on its own when it's ready to go. Might be quickly (lucky you) might be a bit slower (that's me) but day by day you will get better. Anytime Elizabeth!!! if you use a magic bullet be sure to check every little bit and as soon as its thick stop so you dont get butter! i put that in a magic bullet and let it rip. the cream will whip and the rest will mix in and make a thick mousse...split it into 3 portions. you can freeze it if you want. Cool whip has some stuff in it not conduscive to keto..high fructose corn syrup (even in the sugar free) and hydrogenated vegetable oil or shortening. Lots of people get rid of what they have on hand so as not to waste anything, and fit it in..then find subs that do fit. I like the chocolate mousse above WAY more than cool whip, myself. mess around with the proportions. make different flavors...i do caramel with caramel flavoring (in walmart next to the vanilla) coconut or almond flavoring, use the fruit flavorings..i havent seen one yet that has sugar (brand name is watkins) but check them for it before you buy. Heavy cream is your friend!!! I know many (myself included) that whip some cream and freeze it in dollops on a cookie sheet on parchment, the peel them off the parchment once frozen and stick them in a ziplock and freeze. take a dollop out when you need a treat!! you are doing well, and you are pretty normal. In my first months I too suddenly ate things that were not Keto at all, and really not good for a type-2 diabetic. Driving somewhere I'd see a convenience store, and suddenly I'd be buying a rather large chocolate bar, and eating it of course. Sounds like your tactics are better than mine. Over time things changed (thankfully). JAMES: Thanks for sharing the info. I know it will take at least a year - probably a little more. But, that said, I am in it for the long haul. My cravings have MOSTLY stopped. Last night into this morning I was wanting something sweet in the worst way. I took 2 servings of Cool Whip and added a tablespoon of unsweetened chocolate powder, mixed it up really well and put it in the fridge. Tonight after dinner I will savor it LOL I have had no desire for my other "favorites" I make rice & potatoes for my son, but they just get added to whatever meal I'm making for me. This way I don't need to worry about cooking separate meals. which is the excuse I had for leaving the low carb life the last time. I just love the success stories here and know that I will soon have my own successes to report. Thank you Elizabeth!!! Cant wait to read yours!! I so enjoy reading your very own success story, Holly! it took me a year to lose it, James. but remember that i went in with no planning no knowledge and jumped in full force, reading everything i could get my hands on. i was strict from day one..i kept my protein at the lower limits my carbs under 20 and i ate enough calories. i didnt stall till i tried fasting, and it took a while to start losing again after that. remember..i couldnt lose at all on anything else..and i tried it all. when i started i set a yearlong goal to get to 250. i'd only been under that once in YEARS, for about a day. i was shocked to be there in 3 months...the rest went much slower...and since i'd met my goal far faster than i ever imagined, i relaxed and didnt worry about the weight numbers. it will take quite a while to loose 100 pounds. (Holly, how long did your 132 pounds take?). However, that is no reason to loose any optimism. It just takes time. The good news is that carbs do slowly loose their attraction for most folks, so it gets easier, at least for me it did. I still would eat a real chocolate bar if I didn't have willpower. But pasta, rice, mashed potatoes, bread, croutons, ... I just don't like them anymore. The way I look at Keto is from a nutrition point of view (inspired by Dr. Fuhrman who wrote "Eat to Live"), is to focus on nutrients, and avoid empty calories, empty of nutrition that is. Sugar is the poster child of pure calories, and zero nutrients of any kind. Over time ones taste preferences change (mine did). So I love fresh bell peppers, and lots of other veggies, and I tolerated them before. So its not all loss. Over time I think you too will embrace new things and grow in variety. Thanks for sharing James. Fortunately, I don't have to cook for a family anymore. (but for one son with whom I live). I just add pasta, potatoes, rice and/or bread for him and basically no other changes. NightSkyStar your words are very encouraging. I plan to make keto a permanent way of life -- even after I drop 100+ lbs. With the research I have done online, I have found keto-friendly substitutes that will keep me going,. I'm not saying I will NEVER eat a few extra carbs here & there, but I will NEVER stray far from keto. Not just good, but excellent advice from KDGIRL. I totally concur. I am almost 4 months into keto, started low carbing at the beginning of the year. Down almost 20 pounds. Now I am strictly keto, and since I do 98% of the cooking at my house, it's all keto. Plus rice, potatoes, rolls if needed. I do not mind if they are in the house, I do not have a problem resisting them any more. One piece of advice for newbies - track your macros at least for awhile. I "thought" I was keto for two months before I actually got there. I've heard it called "low carb purgatory". Get some fatty dipping sauces you like for veggies or meat or whatever. I recently discovered mustard and mayo together. Yummy. Also, do not expect your weight loss to be linear. Your body is fixing itself, and sometimes needs to do things inside that don't result in weight loss. Trust the process. Elizabeth that looks WONDERFUL!!! and James thats great advice!! Thanks to you both! That looks perfect, exactly what I'm thinking, and your husband adds bread. A congrats from me too on your weight loss, I don't do that often enough. Great advice, James...I cook for just two of us but my dear man is a bread and potatoes man...I cook it but don’t eat it. what I suggest when cooking for a whole family is to make "normal" food, but put the carbs in one (or at most two) distinct choices. Don't make "mixed" things, like breaded meats. All for you except the mashed potatoes. Your family eats as they like. Hi Beach_Dreamer and welcome!! You can do this!!! i started a year and a half ago and never looked back...132 pounds down and doc says i can be done but i'm wanting another 10 or 20...its a forever way of eating!!! Welcome Back!!! I'm still new to the Keto LIfestyle, I'm only 3 weeks in. Bouncing off and on -- kinda tired of that. I have done a lot of research and decided to go Keto for my new (permanent?) lifestyle. I did Atkins a long time ago and had great success, but then I had to feed the whole family and it was just too much like work. Now, it's just me and I'm worth it. I am looking for to great success.